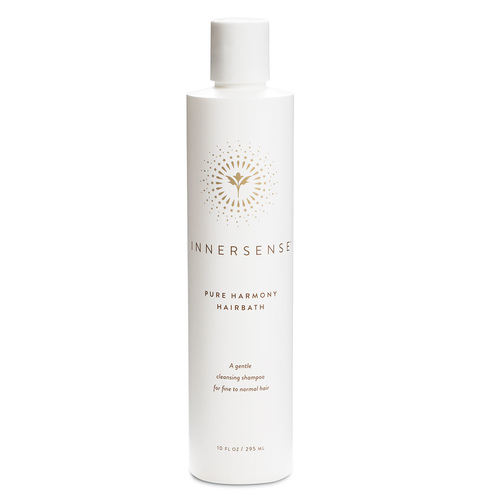 Pure Harmony Hairbath by Innersense Organic Beauty is a gentle hair cleanser that increases a feeling of moisture. Coconut and palm oils make your scalp and hair feel calmed and purified, while orange flower oil offers a sense of harmony and uplifted mood. The sulfate-free, non-toxic organic shampoo leaves hair looking healthy, and full of body and vitality without residue or a feeling of dryness, and is ideal for all hair types. More than a shampoo, Pure Harmony Hairbath by Innersense is a sulfate-free cleanser that delivers the look of vitality to your hair. Fortified with botanicals, like pumpkin seed oil, rooibos, goldenseal, wheatgrass and cranberry seed oil, Pure Harmony gives hair a look of body and shine without signs of residue or dryness. Lightly scented with lemongrass, hair care has never felt healthier. Lather a quarter-sized dollop of shampoo onto wet hair and work into a gentle foam. Rinse thoroughly then squeeze excess water from hair. Water, Aqua- EAU, Cocamidopropyl Hydroxysultaine, Sodium Cocoyl Isethionate, Caprylyl/Capryl Glucoside, Glycerin, Sodium Chloride, Sodium Lauroyl Methyl Isethionate, Butyrospermum Parkii (Shea Butter), Citrus Aurantium Dulcis (Orange) Peel Oil, Citrus Medica Limonum (Lemon) Peel Oil, Eucalyptus Globulus (Eucalyptus), Cucurbita Pepo (Pumpkin Seed Oil)* ,Hydroxypropyltrimonium Honey, Hydrolyzed Quinoa, Trisodium Ethylenediamine Disuccinate, Sodium Benzoate, Hydrolyzed Rice Protein, Guar Hydroxypropyltrimonium Chloride, Potassium Sorbate, Citric Acid, Citrus Sinensis (Orange) Oil*, Persea Gratissima (Avocado) Oil, Oryza Sativa (Rice) Bran Oil, Camellia Sinensis (Green Tea) Leaf Extract*, Cucumis Sativus (Cucumber) Fruit Extract, Persea Gratissima (Avocado)* Fruit Extract, Mangifera Indica (Mango)* Fruit Extract.